Located in Mission District, this hotel is within 2 mi (3 km) of Mission Dolores Park, San Francisco City Hall, and Castro Street. 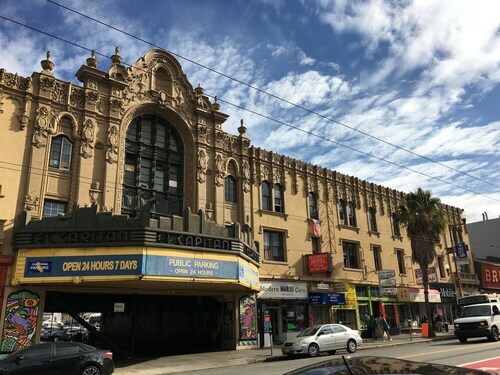 Van Ness Avenue and War Memorial Opera House are also within 2 mi (3 km). 16th Street Mission Station is 8 minutes by foot and 24th Street Mission Station is 10 minutes. 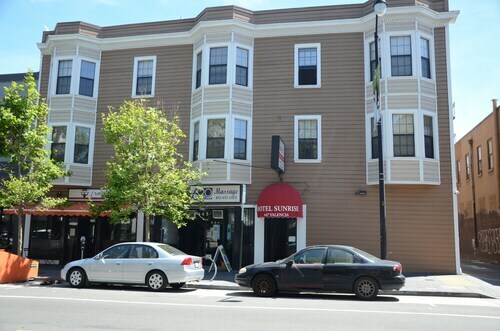 Located in Mission District, this apartment building is within 2 mi (3 km) of Mission Dolores Park, San Francisco City Hall, and Twin Peaks. Castro Street and Van Ness Avenue are also within 2 mi (3 km). 24th Street Mission Station is 12 minutes by foot and 16th Street Mission Station is 17 minutes. 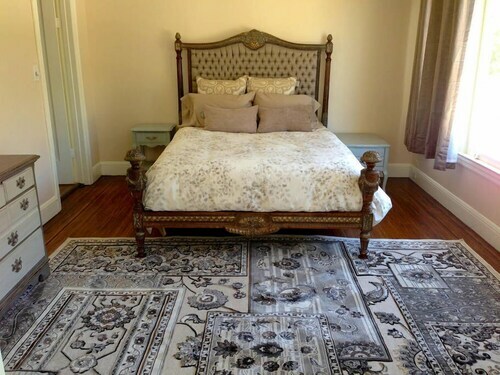 Located in Mission District, this bed & breakfast is within 2 mi (3 km) of Mission Dolores Park, Twin Peaks, and Castro Street. San Francisco City Hall and San Francisco Bay are also within 3 mi (5 km). 24th Street Mission Station is 6 minutes by foot and 16th Street Mission Station is 23 minutes. 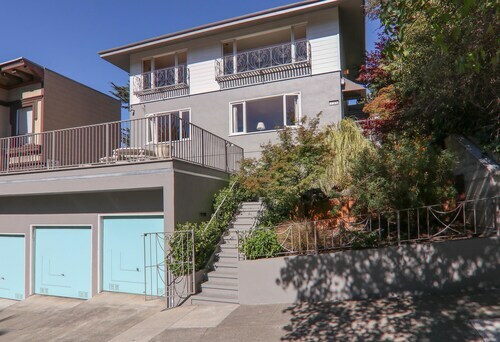 Located in Mission District, this apartment building is within a 15-minute walk of Mission Dolores Park and Castro Street. San Francisco City Hall and Twin Peaks are also within 2 mi (3 km). 24th Street Mission Station is 15 minutes by foot and 16th Street Mission Station is 16 minutes. 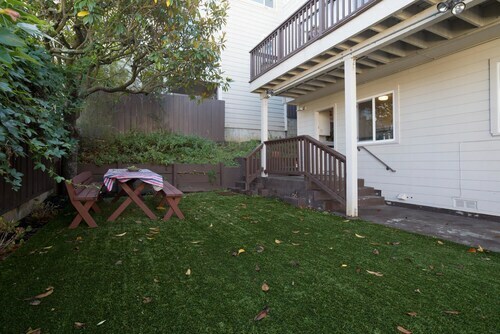 Located in Mission District, this condo building is within a 15-minute walk of Mission Dolores Park and Castro Street. San Francisco City Hall and Van Ness Avenue are also within 2 mi (3 km). 16th Street Mission Station is 16 minutes by foot and 24th Street Mission Station is 16 minutes. 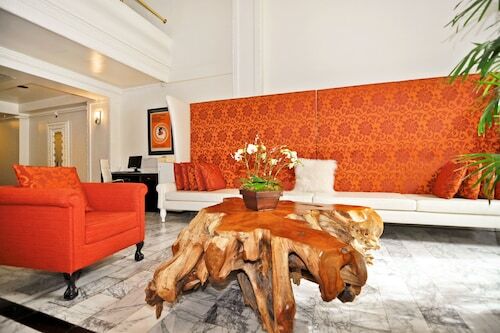 Located in Mission District, this hotel is within a 15-minute walk of Van Ness Avenue and Mission Dolores Park. San Francisco City Hall and Castro Street are also within 1 mi (2 km). 16th Street Mission Station is only a 2-minute walk and 24th Street Mission Station is 17 minutes. 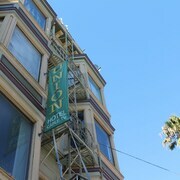 Located in Mission District, this hotel is within a 15-minute walk of Van Ness Avenue and Mission Dolores Park. San Francisco City Hall and Castro Street are also within 1 mi (2 km). 16th Street Mission Station is only a 3-minute walk and 24th Street Mission Station is 21 minutes. 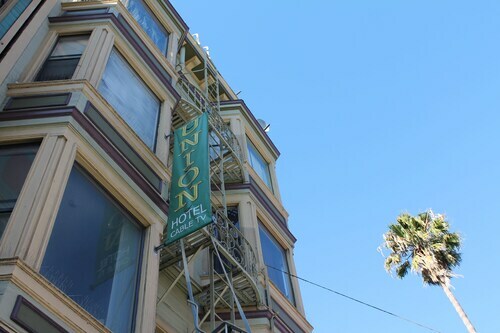 Situated on Market Street between downtown San Francisco and the Castro district, this motel is 4 blocks from Civic Center and City Hall and walking distance from Union Square and the Moscone Center. 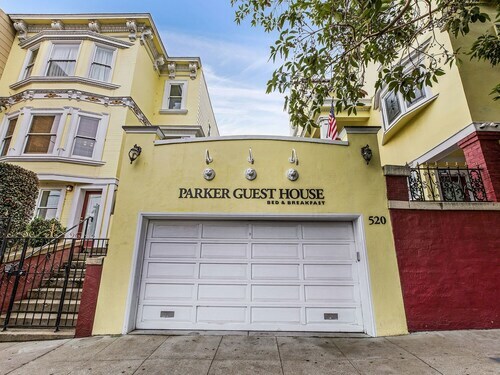 This budget-friendly San Francisco motel is 0.3 miles from the Civic Center and 1 mile from Union Square, AT&T Park, and the San Francisco Museum of Modern Art. Fisherman's Wharf is 2.4 miles away. 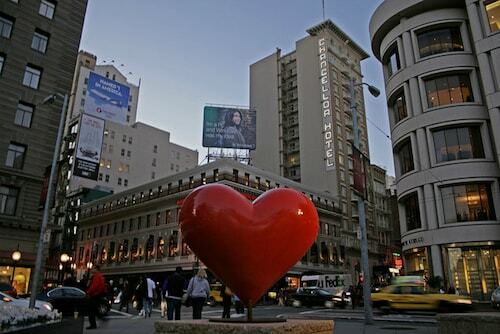 Located in the San Francisco theater district with a BART and MUNI station at its entrance, this downtown hotel is 6 blocks from Union Square and within a mile of Moscone Center and SFMOMA. Many people make the trip to Hua Zang Si each year. 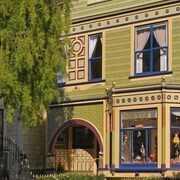 You'll discover it in San Francisco, a well-loved city that occupies a special place in many traveller's hearts. Getting from your hotel to Hua Zang Si won't be hard if you stay nearby, and you aren't short on options. 38 await within 3 kilometres. 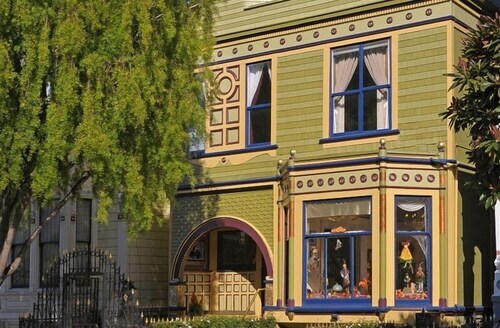 The Sumner House SF (2 kilometres), the InterContinental San Francisco (3 kilometres) and the Inn San Francisco (0.3 kilometres) are all excellent choices. If you'd rather spend your cash on making memories, there's a number of cheaper options. 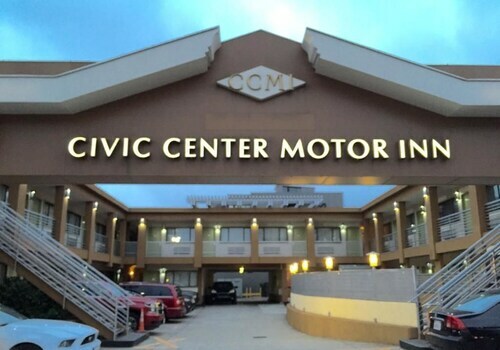 Take a look at the rates at the Civic Center Motor Inn, only 2 kilometres away. Alternatively, the San Francisco Inn is 2 kilometres away. That said, you could splurge a little at one of the luxury hotels. You simply can't find better than the Fairmont Heritage Place, Ghirardelli Square and The St. Regis San Francisco. Ritual Coffee Roasters is the ideal spot to have a cuppa right near Hua Zang Si. Easy to find at 1026 Valencia Street, San Francisco, it's only 0.4 kilometres away. If you're searching for a spot for lunch or dinner, get going to Southern Pacific Brewing. It's at 620 Treat Avenue, San Francisco. Clap for the cast and crew at Marsh Theater, a well-known venue. Street art is one of the finest examples of wild artistic expression, and Balmy Alley is a fantastic demonstration of this. Take your friends and family for a picnic or a peaceful afternoon walk in Mission Dolores Park. Tourists of many different creeds and cultural backgrounds readily appreciate the significance of Mission Dolores. Organise a guided tour and find out how they make their brews at Anchor Brewing Company. How Much is a Hotel Room in Hua Zang Si? Hotels in Hua Zang Si start at AU$88 per night. Prices and availability subject to change. Additional terms may apply. Great location. Very helpful staff and a very good night’s sleep in a comfy bed.